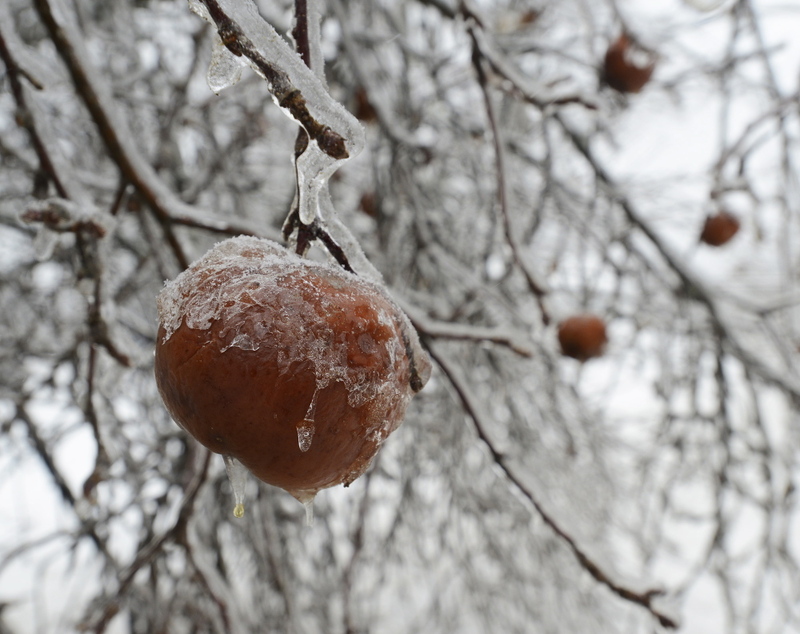 As thousands regain electricity, crews face harsh conditions and extensive damage in areas hit hardest by the ice storm. Homes and businesses in parts of Maine that were hit hardest by this week’s ice storm could be without electricity until New Year’s Day, when temperatures are expected to plunge below zero. Central Maine Power Co. said it plans to restore power by late Friday to the last of its customers who suffered outages in southern and central Maine. But customers in Bangor Hydro Electric Co.’s more sparsely populated service area in eastern and northern Maine – where storm damage was the worst since the ice storm of 1998 – could remain without power for days. Ice accumulations as thick as an inch snapped branches, overwhelmed power lines and even pulled down utility poles, especially in Hancock County, where about 6,300 customers remained without power Thursday night. Some of those customers have been without electricity since Monday, the second day of the storm, and frustration is growing. One line crew restored power to a neighborhood in the Hancock County town of Surry on Thursday, but a couple of houses didn’t get it back. As the workers prepared to move, one of those residents called customer service and got increasingly agitated. “Apparently he did state to the call center rep that he might ‘lose it and kill someone’ if the crew didn’t get his power back on,” said Bob Potts, a spokesman for Bangor Hydro Electric. The utility notified Maine State Police and pulled its crew out of the area. “When you’re talking days without electricity, it’s bad,” said Al Clay, who lives in Franklin, a Hancock County town where about 260 people were without power Thursday night. Clay and his wife, Linda, are accustomed to living at the end of the line – they have a generator to run their well pump and a wood stove for heat – but they’re feeling more isolated than usual. Potts said Bangor Hydro Electric’s 125 workers in the field and 160 from outside the company, including 75 from New Jersey, are working as quickly as they can to restore power. Limbs falling onto lines are causing more outages, he said, and bad travel conditions are delaying restoration efforts, as are bitter-cold temperatures. “That’s probably been our bigger challenge in the last couple of days, is the bitter cold that has blanketed the area,” said Potts. He said workers and equipment don’t perform as quickly in severe cold, and the stakes are higher for customers without heat. Bangor Hydro’s website allows customers to check on outages. Bangor Hydro Electric has been conservative in projecting when people will get their power, so customers can make arrangements to stay with family members or friends, or in shelters if necessary. The Maine Emergency Management Agency kept emergency shelters open in several areas. The agency encouraged residents to call 211 or check maine.gov/mema for shelter openings. Bangor Hydro Electric has contacted other utility companies to request more help, Potts said. Once CMP, which deployed 455 two-man line crews and 450 tree crews, completes its restoration work, those crews could be called on to help Bangor Hydro Electric. CMP reported 7,000 customers without power around 11 p.m. Thursday, more than three-quarters of them in Kennebec and Waldo counties. The company said earlier Thursday that it planned to have all customers’ power restored by the end of the day, but it released an update Thursday night saying cold weather and a snowstorm that dropped as much as 4 inches in Sagadahoc, Lincoln and Knox counties slowed progress and also caused 5,000 new outages. Waldo County, where more than three-quarters of CMP’s 23,760 customers were in the dark at one point Tuesday, was down to 2,733 outages at 11 p.m. Thursday. The CMP website also allows customers to check on outages. At the peak of outages Tuesday, nearly 120,000 customers of CMP and Bangor Hydro Electric were without power. Tens of thousands spent Christmas Eve and Christmas Day without electricity, and hundreds of utility workers from Maine and other states spent their holiday assisting in the restoration efforts. Still, some parts of Maine won’t have power for days. A spokeswoman for Gov. Paul LePage, who declared a state of emergency on Saturday, did not return an email Thursday afternoon seeking comment on the utilities’ response time. U.S. Sen. Susan Collins did not return an email seeking comment Thursday. The National Weather Service said most of the state received 3 to 5 inches of snow on Thursday, including the Augusta area, which already was hit hard by power outages. The heaviest snowfall in central Maine was expected to continue into Thursday night, with temperatures forecast to reach only 25 to 30 degrees. Snowfall amounts varied from region to region. Portland got 2 inches, Naples 3 inches and Scarborough reported 4 inches. Eustis received 5.9 inches. “We’re looking for lows tonight in the teens, with temperatures (Friday) in the upper 20s and low to mid-30s,” said Chris Kimble at the weather service office in Gray. Areas hit hard by the storm probably won’t start thawing out until Saturday, when temperatures reach the mid-30s, he said. Temperatures will then dive and, by New Year’s Eve, low temperatures will be below zero, Kimble said. Potts said Bangor Hydro Electric didn’t realize the full scale of the damage until a conference call Thursday morning, when crew managers started reporting numerous poles snapped and other equipment damaged. Much of the work is being done on narrow country roads that may be poorly plowed. When crews cut tree limbs, weighed-down lines can snap back. The equipment itself is usually iced over, so switching a breaker to de-energize a line takes five times as long, said CMP spokesman John Carroll. CMP line workers are prohibited from working more than 17 hours without a seven-hour rest, Carroll said. There’s also a limit to how many out-of-state utility crews can be summoned, he said. Other states must maintain their own readiness, and it can take a couple of days for crews to arrive and rest before they can start repairs. There also is a limit to how many crews the utilities can manage and keep stocked with equipment. Ultimately, ratepayers cover much of the cost if the Maine Public Utilities Commission decides a utility acted responsibly in its restoration efforts, he said. People who want to volunteer to help people affected by the ice storm or donate directly to the Maine Disaster Relief Fund can go to www.volunteermaine.org/disaster for more information or send donations to: Maine Disaster Relief Fund, c/o United Way of Kennebec Valley, 121 Commercial St., Augusta 04330.